Marie Curie's (1867-1934) amazing persistence in the face of many research obstacles is enough to commend her to historical fame. Her contribution to the field of medicine is overshadowed by her initial discovery of two radioactive elements, polonium and radium. She used these discoveries to help develop therapies for disease. Curie was born Marie Sklodowska in Warsaw, Poland, in 1867. Her mother was principal of a local girls' school, and her father was a physics teacher. Curie excelled at school and was encouraged in her studies by her parents. Unfortunately, Poland was under Russian rule, and Russian authorities did not want educated Poles to become politically active and possibly lead a rebellion. As a result, Curie was not allowed to go to college in Poland. After working for several years, she left Poland for France, where she enrolled at the Sorbonne in 1891. Her meager savings barely covered tuition and rent for her one-room apartment, and she often went for long periods without food and once fainted from hunger during class. Her enthusiasm for learning did not waver, however, and in 1893 she received a degree in physics, graduating first in her class. While pursuing a second degree, she met Pierre Curie, who had made a name for himself by discovering piezoelectricity a few years earlier. The couple was married on July 26, 1895. Soon after the marriage, Pierre earned his doctorate. Marie was still working toward her dissertation, but had not chosen a topic. French physicist Antoine Henri Becquerel (1852-1908; first scientist to experiment with radioactivity) had just discovered that uranium salts emitted (gave off) energy. At his suggestion, Marie set out to find other substances that emitted such rays. It was known that the ore pitchblende possessed properties similar to those of uranium, so the Curies chose this ore as the starting point for their research. Within the pitchblende the Curies detected the presence of a substance that was much more radioactive (a word Marie Curie had coined, or made up) than even pure uranium. They extracted (pulled out) this new element in 1898 and named it polonium, after Marie Curie's homeland of Poland. Although the polonium discovery was quite significant, the Curies were not satisfied. They could tell from their tests that another element, thousands of times more radioactive than uranium, existed in the pitchblende, but in such small amounts as to be nearly undetectable. Another French chemist confirmed the presence of this element—which the Curies had named radium—by examining pitchblende's spectral (wide band) lines. This did not convince many scientists, nor did it satisfy the Curies, who were determined to prove the existence of radium by extracting a measurable amount. This would be no small task, since several tons of pitchblende would have to be refined in order to produce even a gram of radium. Pierre Curie abandoned his teaching position in order to assist his wife's research. Though Marie Curie was the engine and mastermind of the project, she and her husband worked as a team. In fact, all of the notes in her dissertation refer to the experimenters as "we"—neither she nor her husband are mentioned individually. The Curies spent the bulk of their life savings to purchase waste ore from Czechoslovakian mines. They rented a leaky wooden shed in which they could refine the raw ore, and for the next four years they refined and purified the pitchblende, producing smaller and smaller samples that were more and more radioactive. The exhausting process, ordinarily performed by a team of several mine workers, took a physical toll upon the couple. This work, along with the birth of their daughter Irene, was nearly too much for the couple. Only Marie's intense determination kept things going. 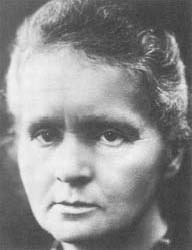 By 1902 the Curies had extracted one-tenth of a gram of radium, enough for Marie to finish her dissertation. The Curies and Becquerel shared the 1903 Nobel Prize in physics for their contributions to the new science of radioactivity. Pierre Curie was also offered a professorial position in the Sorbonne's research laboratory, an offer that included his wife coming along as his lab superintendent. In 1906, however, tragedy struck when Pierre Curie was crushed to death in a traffic accident. Marie took over his position and continued his lectures at the exact point at which they were interrupted. She was the first woman to teach at the Sorbonne. In the years after her husband's death, Curie conducted extensive work at the new Paris Institute of Radium. In spite of its mysterious properties, radium was used as a medicinal aid. Though it was often used without thought to its dangers or effectiveness, Curie proved that there were certain illnesses for which radium was effective. It played an important role in the treatment of cancer, and is still used for this purpose today. Curie also introduced the use of radium and X-ray technology in medicine. For the discovery of radium and polonium, Curie was awarded the 1911 Nobel Prize in chemistry, becoming the only person to hold two Nobel laureates in the sciences. Except for World War I (1914-1918), during which she drove an ambulance, Curie spent the remainder of her life studying radium therapy. Though the process was successful, she received no royalties from its use, since she and her husband had chosen not to make money from their discovery by patenting (registering) it. Late in Curie's life, the dangerous nature of radioactivity took a personal toll. Curie's long years of exposure to radium resulted in leukemia (a disease that effects blood-forming organs), which lead to her death in 1934. Today, Curie is historically remembered as an outstanding female scientist, as well as one of the world's greatest researchers. this also helped me with my science report the information in it is good! I'm glad people recognise her work. THANKS FOR THE HELP!! THIS WAS A REALLY GOOD RESOURCE. she is the greetst, person in the world i love this stor about muria curie this is good. Although this is a very good resource, it didn't help me find what Radium did to help medicine.